Sharon’s in-depth knowledge of Scripture, combined with an engaging story telling style, keeps listeners on the edge of their seats. Sharon’s presentations are excellent for a variety of women’s events such as banquets, conferences, and retreats. Each topic is approximately 50-60 minutes and several can be woven together for conferences and weekend retreats. Whether it is a weekend retreat or conference keynote, Sharon’s in-depth knowledge of Scripture and storytelling style keeps listeners on the edge of their seats. Peppered with laughter and salted with tears, Sharon shares how God miraculously transformed her family riddled with alcohol and abuse. God took a little girl bound by feelings of inferiority, insecurity and inadequacy and transformed her into a woman of courage and confidence. Her desire is to encourage, equip and empower women to discover their position and purpose as a child of God and a co-heir with Jesus Christ. When Sharon spoke at our women’s event, ladies came from eleven states and Canada to hear her. One hundred twenty-four churches in attendance! Over forty women accepted Christ for the first time. Sharon is funny, transparent, and engaging. We are still hearing how the women were impacted two years later! Sharon Jaynes is an absolute delight and true blessing to have for any ladies conference. Her message is easy to relate to, captivating, humorous, and spot on in all ways! She is truly beautiful inside and out. What a joy to work with – so down to earth and easy to talk to. Guests and event planners alike will walk away uplifted and encouraged after spending time with Sharon. Her straight-to-the-point message will renew listeners’ faith and love for God no matter where they are on their faith journey. Don’t hesitate! Book Sharon now! You won’t regret it! As director of the Women’s Ministries of the Sacramento District Church of the Nazarene I had a lot of contact with Sharon in preparation for our conference. Our ladies were truly ministered to with Biblical truth, humor and a great dose of God’s anointing. Sharon is a woman of great integrity and a tremendously gifted speaker with a heart after God and the women He loves! 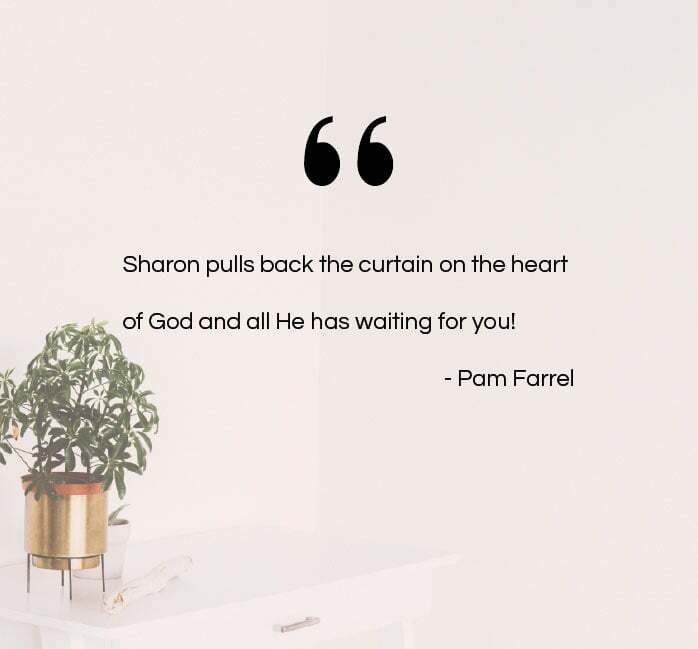 In over 20 years of teaming up with speakers to offer an annual women’s conference in New England, Sharon is clearly one of our very favorites. She knows how to feed the hungry soul with life-changing and relevant Truth for both seekers and seasoned believers, and when we have been blessed by the transparent way she offers herself and her gifts, everyone can agree that the Holy Spirit has worked through her and in us! Follow-up for many women who come to us from a distance is always a concern, so we are thrilled to offer women an opportunity to continue to find encouragement through her excellent books and on-line devotions. Sharon is a joy to work with as she approaches her ministry with wisdom, humility, and a desire to come alongside. From the beginning she has responded in sweet friendship, and it is no wonder that women ask for her again and again! 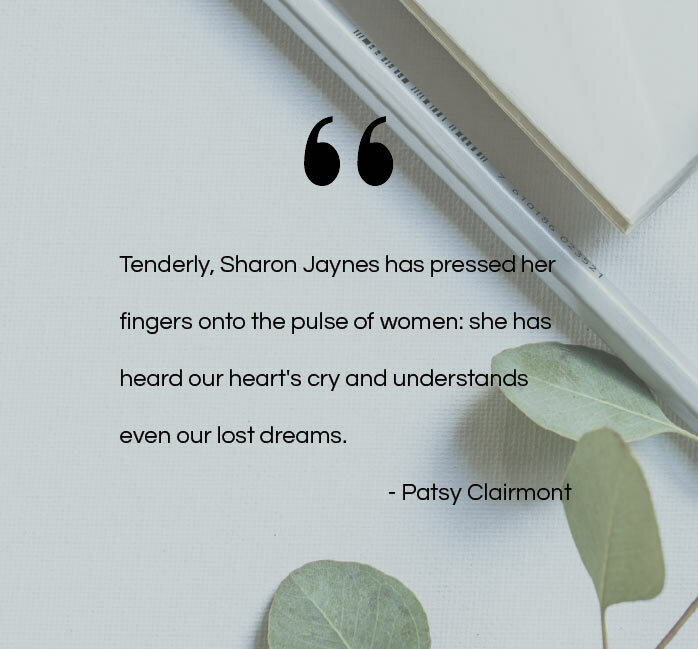 We have had several nationally recognized speakers for our City Wide Women’s conferences over the past years, and it’s been repeatedly stated that Sharon Jaynes was our all time favorite. She is a solidly Bible based teacher, and both genuine and transparent in her delivery of the message she brings. Her message to us was one of life transformation and HOPE, amidst this sometimes crazy and chaotic world. Our Ladies are STILL quoting her, referencing her books, and following her through her Girlfriends in God website and personal blog. Sharon Jaynes is not only a wonderful speaker, but has become a friend forever! She leads audiences on a spiritual treasure hunt to discover their true identity and see themselves as God sees them. Her messages inspire women to grasp the truth that can set them free, transform pain into purpose and become the magnificent creatures that God planned all along. No matter where a woman is on her journey toward the heart of God, Sharon helps them take the next step closer. Below you will see some typical topics and suggested event themes. However Sharon loves working with ministry coordinators to tailor each event to the unique needs and requests of the women. She loves brain- storming with leaders to make each event fresh, creative, impactful, and meaningful. Most women long to experience the abundant, thriving faith that Jesus came to give. However, many get stuck in the mediocre mundane faith that is less than what they'd hoped for. Sharon compares our faith to a trapeze artist who swings out, swings back, and then on the third swing takes hold of another bar to per- form flips, twists, and summersaults. But what if he refused to let go of the first bar. He would be stuck hanging in the middle...which is where many of us are today. Paul wrote in Philippians 3:12, "I press on to take hold of that for which Christ Jesus took hold of me." In order to "take hold" of what Jesus has already taken hold of for us and placed in us, we have to "let go" of everything that holds us hostage and hinders us from doing so. We'll learn how to let go of insecurity and take hold of our true identity; let go of inadequacy and take hold of God's sufficiency; let go of the tendency to compare and take hold of our uniqueness; let go of a painful past and take hold of a purposeful future. Sharon camps out fireside with Moses at the burn- ing bush to answer four questions that we all must answer to experience life to the full. She'll show you how to turn stumbling blocks from the past into stepping stone in the present. Women leave ready to let go of all that hinders them from living life to the full, move forward to do all that God has fashioned them to do, and live bold in the adventurous faith. Based on Sharon's books, Becoming Spiritually Beautiful and I'm Not Good Enough...and Other Lies Women Tell Themselves. Jesus said, "I have come that they might have life, and have it to the full," (John 10:10). So what keeps us from experiencing that abundant life that we all long for? What keeps us from living in the freedom that Jesus gave His life for? What keeps us from entering our own personal Promised Land? In this session, Sharon shares how a full calendar does not mean a full life. She shares how feelings of inferiority, insecurity, and inadequacy can stand in the way of experiencing all that God has planned for those who love Him, (1 Corinthians 2:9). However, when we believe the truth of who we are, what we have, and where we are as a child of God, He turns our "I can't" into "God can." This liberating seminar also includes a session on Leaving the Past Behind and Taking Every Thought Captive. While this topic works well as a stand along keynote session, it is most effective as a multi-session conference or retreat. This conference is similar to Becoming Spiritually Beautiful, but wrapped in a different package presentation. Based on Sharon's book, The Power Of A Woman's Words. Words... one of the most significant forces in the universe... can be used for good or evil. Our words can change the course of a day... the course of a life. They become the mirror in which others see themselves. Our words can instill confidence into a child's heart, encourage a husband to accomplish great feats, fan the dying embers of a friend's smoldering dreams, cheer on fellow believers to run the great race of life with endurance, and draw the lost to Christ. Sharon inspires women to use words in positive ways as she ex- plores the power we possess, the people we impact, the potential for change, and the profound possibili- ties when we harness this mighty force and use it to speak life to those around us. "Just trust me." Those are the words we hear in movies just before someting bad is about to happen. And yet, we are told to trust God. In a culture where we tend to take control of our own lives, trusting God has become a religious platitude rather than a life-changing attitude. We say it, but do we mean it? And what does trusting God look like? In this session Shaon shows women how trusting God turns pitiful into power- ful, fretful into faithful, and a worrier into a warrior. 1 Corinthians 2:9 says, "No eye has seen, no ear has heard, no mind has conceived all that God has planned for those who love Him." And when we trust God, those plans become an experiential reality in our lives! hang on to your hats! Trusting God takes you to amazing places! This session is perfect for a one-time keynote or a multiple-session event. Based on Sharon's book, The 5 dreams of Every Woman. The desires have been there for as long as we can remember: to be beautiful, to be a bride, to be a mother, to be a cherished daughter, and to have a best friend. But for many, life took a different turn than they expected. In this session, Sharon challenges women to dust off their hopes and dare to dream again - through God's eyes. She shares stories of both biblical and contemporary women: their broken dreams, interrupted dreams, and most importantly, restored dreams. Women realize that God still has dreams for their lives and has not forgotten them. She gives six steps to discovering God's plans for our lives and fills them with courage to take the first steps of faith. 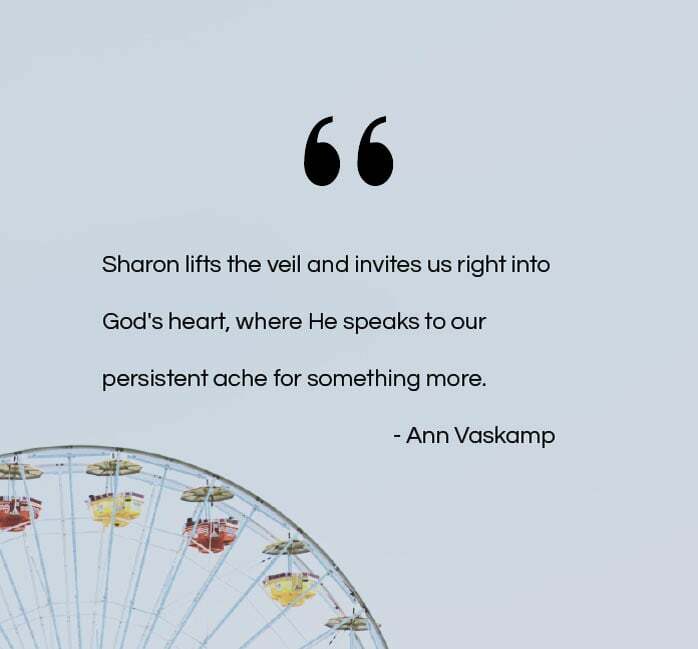 Sharon encourages women to place their hands firmly in His - take a deep breath and begin the exciting journey to a place they thought they'd never find: the dream God planned for them all along. This topic is a perfect for retreats with multiple sessions or as one stand alone keynote. For an entire list of topics and sessions for retreats, download Sharon's Speaker Sheet. into their lives making God's voice the loudest voice and encourage them in every facet of their lives. If you have an event coming up and you’d like to connect with Sharon to see if she would be a good fit for your audience, please fill out the information below and we'll get back to you soon.